We developed our platform based on the features our clients requested, and we still operate the same way today. Here at CallTrackingMetrics, we choose to evolve our software based on the requests and suggestions of our users. This is how we stay ahead of the curve and adapt to the changing needs of our customers. Our most popular request to date has been to empower account administrators with the ability to set exceptions in their schedule for days when resources are slimmer. This need would arise, for example, when a call center adjusts their hours for a national holiday, or needs to route calls to remote agents for a few days. Guess what? It’s finally here! We’re so excited to announce this new feature, which will be deployed across Marketing and Contact Center accounts during the week of July 22nd. Amazing, right? But that’s not all – our favorite part of this new scheduling logic is that you’ll be able to “set it and forget it“. 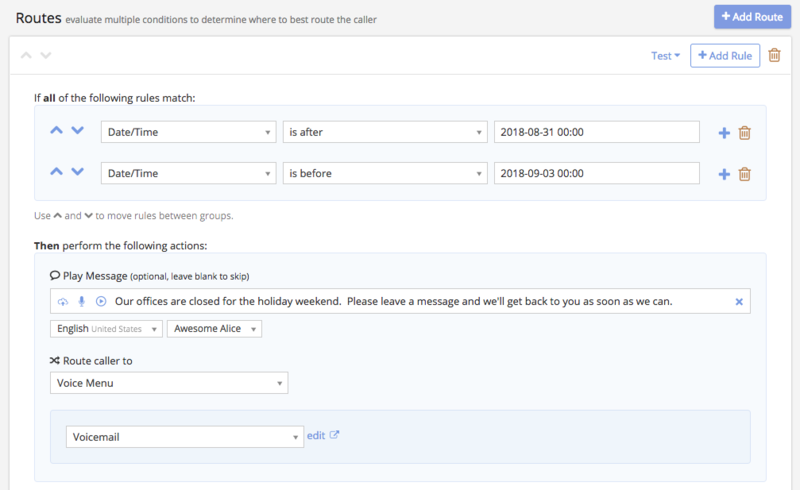 Date-specific routing doesn’t have to be set up immediately preceding the holiday and then removed directly afterwards. In fact, this type of specific scheduling can be built out far in advance and left in place for as long as you need, without affecting your normal operating procedures. Want to learn more about Smart Routing? Check out this help article on how to set it up, or upgrade to a Marketing or Contact Center plan in order to take advantage of this feature today.